My friend and designer/stylist, Genna Yussman Greene is always full of ideas. She came into posession of a dressed that reminded her of paper dolls. She showed it to me and suggested I do paper pieces. My passions as both a hairstylist and artist ignited with the end result of three distinct paper wigs. Below are the complete wigs. I spent several hours crafting them. I used cardboard to create the foundation and a glue gun to easily adhere the paper. I would cut several pieces in various sizes of the same shapes to create visual dimension. I would curl longer pieces around pencils to create curls. I chose to go with the color blue for all three. We photographed and prepped models at our newly rented larger space, “Absolute Studio MGT”. We originally booked only one model for this project, Briana Velazquez who who would be relocating to LA. 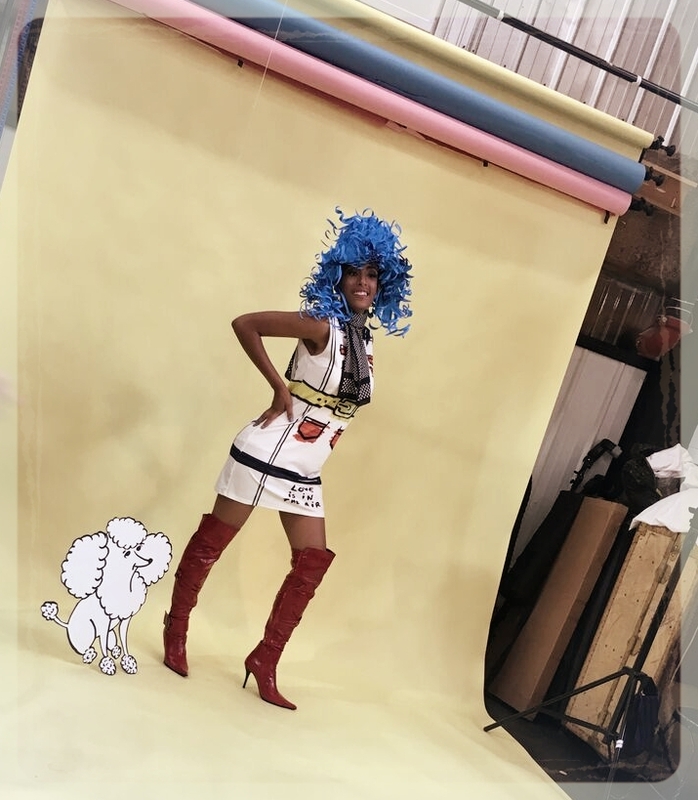 On the day of the shoot model, Jasmine Graham stopped by the studio to say hello and we convinced her to get in front of the camera as we all had plenty of extra items on hand we quickly readied her for camera. model, Jasmine on set and ready to go! Photographer, Tony Welsher did a wonderful job capturing the models on camera. He and Genna chose the yellow backdrop and creating the appropriate lighting to give the shoot that cartoon-like feel. I am so happy to be working with this team and we have some amazing work on the way. So grateful to Bangstyle who wanted to feature this collection. I was also challenged with doing make up on set….My first love of course is hair but I started out in the salon doing a lot of prom and wedding make up. I always say, “learn the basics.” The hairpiece below that Briana is wearing was made of adhering several sheets of paper together and cutting thin sections parallel together and i snipped into the fringe to see her eyes once she was wearing it. The below wig “Glamour Girl” on Jasmine was created with thin strips of paper I coiled around pencil and glued to cloud cut pieces of blue construction paper for a voluminous, campy-feel. Transporting the wigs was fun too….I had to carefully strap them into my car to avoid them getting smashed, torn or bent. I love working with many different artists but working with the same allows for growth, contuniity and inspiration. stay tuned to see what the artists of Absolute Studio MGT have in store.